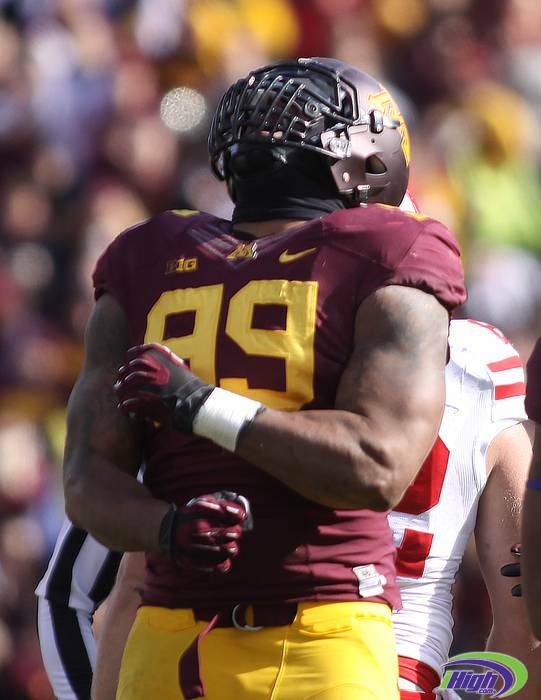 University of Minnesota defensive lineman Ra’Shede Hageman is headed to the Atlanta Falcons. Hageman was taken in the 2nd round on Friday by the Atlanta Falcons with the 37th overall pick. Eden Prairie, MN (May 9, 2013) – The University of Minnesota and the Minnesota Vikings have agreed to terms on a Facility Use Agreement that allows the Vikings to use TCF Bank Stadium for the 2014 and 2015 NFL seasons. The agreement also allows for two additional seasons, if necessary. The agreement is subject to approval by the University’s Board of Regents, which will vote on the proposal during its meeting Friday, May 10. The use agreement stipulates that the Vikings will reimburse the University for any required TCF Bank Stadium capital improvements, as well as all game-day operational expenses. In addition, the Vikings will pay the University a per-game rent of $250,000 for the 2014 and 2015 seasons, with minimal increases if additional seasons were to be required. The team will also share $50,000 per game in concessions, advertising and sponsorship revenue. In total, the Vikings will pay the University $300,000 per game, with a maximum of $3 million for each NFL season. The agreement also includes the creation of a Minnesota Vikings Good Neighbor Partnership Fund, which will be established and administered through the existing University Good Neighbor Fund. The Vikings will contribute $125,000 per NFL season, a combination of cash and in-kind contributions, to the Partnership Fund, which will be used to implement tangible and visible projects during the years the Vikings play at TCF Bank Stadium. The projects selected must be beneficial to the nearby neighborhoods and businesses, allow for participation by the Vikings and their partners and be approved by the Vikings. The good news for Gopher fans reverberated throughout TCF Bank Stadium Saturday morning, or so they thought. Michigan’s dynamic quarterback and Heisman hopeful Denard Robinson would not play because of an elbow injury. His availability had been a question mark all week, but prior to gametime Wolverines’ head coach Brady Hoke made the right call, save Robinson for another day…a day where his team would actually need him. Today was not that day. With Devin Gardner at the helm (234 yards, two TD passes) the Wolverines waltzed to a 35-13 win over the Gophers. Yes for the 29th time in 31 outings, the Wolverines would lay claim to the Little Brown Jug, one of three trophies that has become a rumor in Minneapolis these days. And herein lies the issue. What is the point of a trophy game that the same team always wins? Why pretend that there is any meaning to this for any of the current Gophers, or former Gophers who are currently in their early 50’s? The last time Minnesota won a game against the Wolverines in Minneapolis, parents of the current Gophers were likely in grade school, or younger (1977). Minnesota is so far off the radar of Michigan fans that most Wolverines’ faithful think that the Jug was a permanent fixture and relic of the Big House…something that Bo Schembechler used to sip moonshine out of when games against Woody Hayes became too intense. They were unaware that once every 15 years or so, it pays a visit to Minnesota. Let’s face it…the Gopher program and the University of Michigan’s bare little resemblance to each other over the last 50 years. Michigan is the winningest program in college football history. Minnesota is not. Michigan has way bigger fish to fry in their annual blood battles with Michigan State and Ohio State. Rivalries where one team actually wins more than once every 35 years at home. Heck, even in some of their darkest days the last few years, the Wolverines could still count on at least one win thanks to the Maroon and Gold…even if it wasn’t a true rivalry. It was a trophy that they could always count on. It’s bad enough that the Gophers are now saddled with playing Michigan every year because of the Legends/Leaders divisional setup (they used to get a reprieve every few years when the Big Ten had 11 teams and you didn’t have to play everybody every year). Let’s get rid of the outdated symbolism of this meaningless trophy. If Jerry Kill can throw $800,000 out the window to get out of two games with a mediocre North Carolina team, getting rid of the non-existent “trophy” game against Michigan should be a drop in the jug. 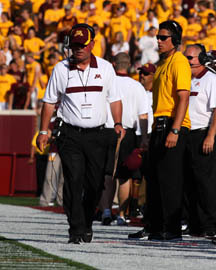 University of Minnesota head football coach Jerry Kill is said to be in stable condition after suffering a seizure late in Saturday’s game against New Mexico State at TCF Bank Stadium. The Gophers lost the game 28-21. U of M team doctors say that Kill has a history of seizures and that he was never in danger. Kill suffered the attack with :20 seconds remaining in the game after a controversial non-call of interference near the Gopher sideline. The game was delayed for over 20 minutes while medics and doctors worked on Kill. Murray Warmath, who coached the University of Minnesota football program from 1954 to 1971 died on Tuesday at the age of 98. Warmath compiled a career college football record of 97–84–10. In 18 seasons at Minnesota, Warmath’s teams had a record of 87–78–7, won eight games in a season three times, and captured the program’s most recent national chammpionship in 1960. Warmath was named the national coach of the year by the National Sportscasters and Sportswriters Association in 1960 and led the Minnesota to its most recent trips to the Rose Bowl in both 1961 and 1962. Warmath made several appearances at new TCF Bank Stadium over the past two years including for its inaugural game in September of 2009.